Each 100 g contains: Valnemulin (HCl) 10g; excipients q.s.p. 100g. Valnemix® C100 Px is an antibiotic based on valnemulin, which belongs to the pleuromutulin group, acts by blocking the production of proteins by bacteria, stopping the growth of these. Valnemulin is active against several bacteria that can affect both the lungs and the intestine. To treat or prevent a series of bacterial diseases that affect the lungs (such as porcine enzootic pneumonia) or the intestine (such as swine dysentery, porcine proliferative enteropathy, or porcine colonic spirocetosis). Swine: Preventive, clinical signs of porcine colonic spirochetosis (colitis): 250 mg/kg of food for 7 days and up to 4 weeks. Treatment, swine dysentery and clinical signs and porcine proliferative enteropathy (ileitis): 750mg of Valnemix® C100 Px /kg of food for 7 days and up to 4 weeks or until the signs of the disease disappear. 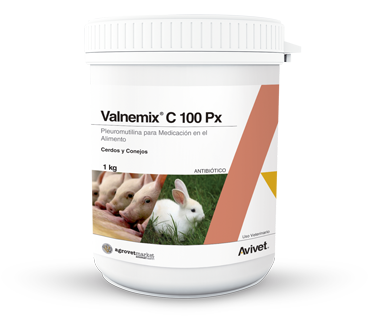 For the treatment and prevention of swine enzootic pneumonia: 2g of Valnemix® C100 Px / Kg of food for 2 weeks.